A grand total of fifty-five countries – stretching from Europe to the Persian Gulf – have banned asbestos. Unfortunately, it’s not just a workplace hazard either. Asbestos hides in many products – including (shockingly) kids’ crime kits and crayons, hair blowers, textiles, and beauty products. These haz-mat products are everywhere, including in our homes and schools. This carcinogen is still legal in the U.S., though it’s far more regulated than it used to be. Instead of outlawing it completely, health authorities simply admonish us to handle with care. Fortunately the cancer it causes is rare, affecting just 3,000 Americans per year. But if you do get it, you’ve got a problem, because it’s aggressive, incurable, and not usually discovered till stage three or four. And that is very late in the game to discover any kind of cancer. Asbestos-related cancer also has a long latency period, so you may’ve been exposed to it 40 or 50 years ago (when it was much more common), and never experienced any consequences until now. Given the tiny number of cases, I don’t regard this threat as something to keep you awake at night – assuming you weren’t in a job where you were exposed. But it gets an enormous amount of publicity – it’s been an unbelievable boondoggle for lawyers – so let’s take a look and see what’s what. . . It contains six naturally occurring minerals – their thin, tough fibers widely used in commercial and industrial applications. Use surged during World War II and peaked in the 1960s. In its heyday, asbestos was used in many industries and was nearly ubiquitous. So it should come as no surprise that nearly everyone was exposed one way or another. Even today, low levels of asbestos exist in our air, water, and soil. The automotive industry used it in brake shoes and clutch pads. Reportedly it may still be used in some vehicles. It’s found in vermiculite garden products and perhaps in some space heaters, and allegedly in some makeup, talc, and crayon products. Asbestos is now shunned as a carcinogen – for good reason. But it wasn’t always that way. The negative health effects of asbestos became evident early in the 20th century, especially for asbestos miners. But workers weren’t informed of this until the 1970s. The Navy knew about these risks in 1939, yet ignored the surgeon general’s concerns. In the 1970s, Occupational Safety and Health Administration (OSHA) and the Environmental Protection Agency (EPA) finally started regulating asbestos. But it wasn’t until 1987 that the International Agency for Research on Cancer (IARC) declared asbestos a human carcinogen. A year later, the EPA estimated that some 750,000 public buildings in the U.S. were constructed using products containing asbestos. In 1989, the EPA placed a ban on the use of asbestos. But the ruling was contested, and limited use of asbestos was allowed to continue. Regulations are becoming stricter – albeit slowly. At least now it’s understood to be a hazardous material. OSHA has strict guidelines for handling it, though they stop short of banning it altogether. How well the regs are enforced is anyone’s guess. While all this sounds very scary, I want to emphasize again that asbestos-related cancer is rare. If anything, the reaction to its use in industrial products has been hysterical and overdone. You only have to worry about loose dust that might be inhaled – and generally in building materials the asbestos is thoroughly bound, it doesn’t find its way into the air. I would make an exception regarding the Navy and shipbuilding industries, where it does seem the handling of asbestos was careless and irresponsible. Even there – the danger of a shipboard fire, especially during World War II, could be considered a far greater danger than a relatively small risk of cancer decades in the future. 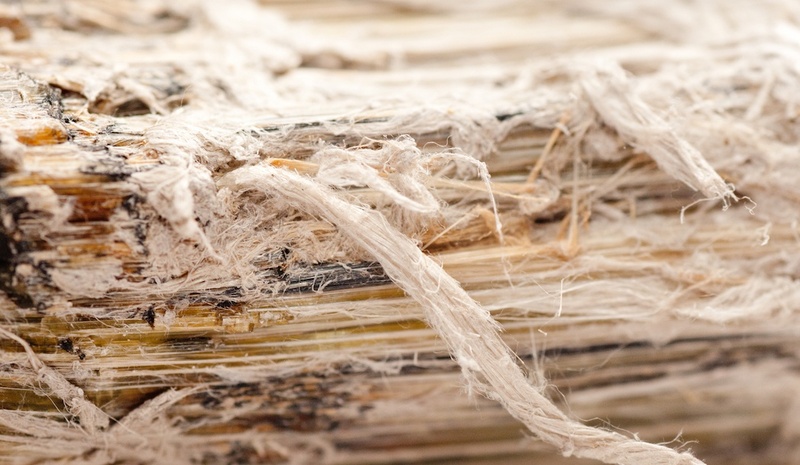 As I mentioned, asbestos poses the biggest threat when its tiny fibers become airborne and are inhaled. Their sharp fibers embed in the lungs or lining of the lungs (pleura) or other organs, and accumulate with repeated or long-term exposure. This leads to inflammation, irreversible scarring, cellular damage, and cancer. Fibers also disrupt cellular life cycles, trigger gene changes and mutations, and impair growth-regulating cells. Finally, it triggers breathing problems and other serious conditions, including pneumonia-like asbestosis, lung fibrosis, lung cancer, and mesothelioma (cancer of the mesothelium, the lining of internal organs). Most people exposed to asbestos don’t become ill from it. The exceptions are typically those who were (or are) exposed frequently. Even so, an estimated 1.3 million employees across several industries are still exposed to asbestos on the job. It’s clear that health risks rise with heavier and longer exposure. But it’s also not unheard of to discover asbestos-related diseases in people with only brief exposure. Family members of heavily-exposed workers also have an increased risk of mesothelioma…5 probably due to residual fibers on the shoes, clothing, skin, or hair of workers. Individual risk factors (smoking, pre-existing lung disease)… Smoking predisposes you to greater harm. Studies suggest that smoking combined with asbestos exposure boosts mesothelioma risk by 90%… greater than the individual risks from asbestos and smoking added together.7 Quitting helps lower your risk. Mesothelioma is more common in men than in women, because men more often work in high-exposure jobs. There is no safe form of asbestos, although one form – amphibole – is considered especially harmful. There’s no known way to clear fibers from your lungs. If you know or suspect you’ve had asbestos exposure, you owe it to yourself to be aware of the symptoms and inform your doctor of your exposure. Especially because mesothelioma patients don’t usually show symptoms (and therefore aren’t diagnosed) until it’s a stage three or four cancer. Sorry to say, these symptoms are also characteristic of other more common, less serious health problems, so often mesothelioma is thought to be something else. There’s no single path to a clear mesothelioma diagnosis. The process typically starts with a medical history… followed by X-rays, CT scans, MRIs, and PET scans. But only a biopsy can confirm a mesothelioma diagnosis. Because different medical professionals perform each of these tests, diagnosis can take two to three months from when the first symptoms are noticed. Providing your doctor with a comprehensive work history is key to the diagnostic process. Since mesothelioma is a rare disease with nonspecific symptoms, doctors don’t usually suspect it unless patients mention on-the-job asbestos exposure. If you’re diagnosed with mesothelioma (or any cancer), you should always get a second opinion. Always. Especially for mesothelioma, negligence is often assumed and attorneys and oncologists line up for sky-high payouts. You don’t want your life turned upside down for a false or faulty diagnosis. Once mesothelioma is diagnosed, conventional treatments offer little value… most patients die within a year, even with treatment. Average life expectancy for mesothelioma patients is a dismal 12 to 22 months from diagnosis. Forty percent of patients live a year or more; less than ten percent are still alive five years from diagnosis. Still, statistics do not define your destiny. Take Paul Kraus, for instance. He was diagnosed with metastasized mesothelioma and given six months to live. That was in 1997. He’s still defying the odds! A Holocaust survivor and fighter, he refused to surrender to his diagnosis. With the support of his wife and doctors, he overhauled his life from head to toe, from his diet to his recreational habits. He ate cancer-fighting vegetables, fruits, and herbs, exercised, and meditated twice a day. Even then, it was a slow journey. But he says his health challenges have made him stronger. Twenty-some years later he’s one of the longest survivors… of both mesothelioma and the Holocaust. He’s just one of many who overcame mesothelioma by being willing to look beyond conventional treatments. Long-term survivors seem to have one unifying link – a strong sense of self-empowerment. They take personal responsibility for their decisions to accept or reject certain treatments. They research and consider new options, and have a strong support group. They look at the bright side of life, even on the darkest days. They pray and meditate. If you’re a long-term reader of this newsletter, you know that these factors are common to survivors of ALL types of cancer, not just mesothelioma. IARC Working Group on the Evaluation of Carcinogenic Risk to Humans. Arsenic, Metals, Fibres and Dusts Exit Disclaimer. Lyon (FR): International Agency for Research on Cancer; 2012. (IARC Monographs on the Evaluation of Carcinogenic Risks to Humans, No. 100C.) Referenced at https://www.cancer.gov/about-cancer/causes-prevention/risk/substances/asbestos/asbestos-fact-sheet . Retrieved on March 15, 2018. Goldberg M, Luce D. The health impact of nonoccupational exposure to asbestos: what do we know?European Journal of Cancer Prevention 2009; 18(6):489-503. Agency for Toxic Substances and Disease Registry. Toxicological Profile for Asbestos. September 2001. Retrieved on March 15, 2018.